Take the opportunity to enjoy the exhibitions of Chagall and Joana Vasconcelos at the Guggenheim Museum. Marijaia is quintessentially the character of the Bilbao festivities. 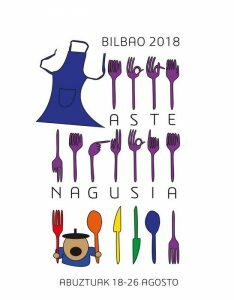 Now you can even download your song for August 18 at 7:00 pm to be able to sing it and feel part of the Aste Nagusia even more if possible. From that moment, music, theater, folklore, fireworks, the ‘Txiki City of values’, the txosnas … will be shown in different areas of the city to enjoy a few days with great atmosphere. As you approach Bilbao, we recommend two exhibitions that you can’t miss at the Guggenheim Museum Bilbao: ‘Chagall. The decisive years. 1911-1919 ‘and the exhibition by Joana Vasconcelos, considered one of the most outstanding artists of the last decade, who has developed her production mainly through sculpture and installation. His work deals mainly with the question of identity, in all its dimensions and proposes a reflection on Vasconcelos’ own condition as a Portuguese and European woman and artist. More information and program of the festivities.